Well, after almost ~2 months of continuous work here in Denver I was thinking of a break. And suddenly one day my colleagues asked me if I’ll be ready to join them and their family for a trip to Aspen, and I immediately agreed. 🙂 This was going to be my first trip and a long drive, so I was really excited. The plan was to start early in the morning and come back by evening. Aspen is situated in Colorado’s Rocky Mountains at an elevation of ~7,908 feet above sea level, and comes under the Pitkin County. It is a Ski Resort town and a year-round destination for outdoor recreation. It’s a small town with population of ~6,658 as of 2010 census, and the city is spread in total area of 3.5 square miles (9.1 square km). The climate of Aspen in winters (DEC-JAN) ranges form 9.4 F (−12.6 C) to 34.7 F (1.5 C), and in summers (JUNE-JULY) ranges from 42.3 F (5.7 C) to 72.8 F (22.7 C). Aspen is connected with State highway CO-82 that merges with I-70 and CO-24/91. Aspen also has a small airport Aspen-Pitkin County Airport aka Sardy Field. Zip (PO) Code: 81611, 81612. Aspen, as I mentioned is famous for its Ski resorts and winter sports, like skiing, snowboarding, etc. So its a favorite destination for movie stars, singers, and high net worth individuals. Aspen is also famous for its Fall colors all through the way, and in August-end it was bit early for us to go. The real time to see the colors of Fall Foliage is the 3rd and 4th week of September. We started at around 9:00 am from Aurora area (at E Mexico Ave), and took the following route: Took I-70, Idaho Springs, George Town, Dillon/Silverthorne/Frisco, CO-91 and CO-24 to Leadville, CO-82 to Twin Lakes, Independence Pass, finally Aspen, total distance of 159 miles (256 km). After crossing Georgetown we passed through the Eisenhower Tunnel, which is four lane and ~1.7 miles ( or 2.7 km) long. Took a small halt at Silverthorne to munch some food as we didn’t had breakfast. Its a nice place to hang around and shopping at some factory outlets. Just nearby there is a big lake named Dillon Reservoir. We didn’t had much time to visit it, otherwise we would have reached late in Aspen. 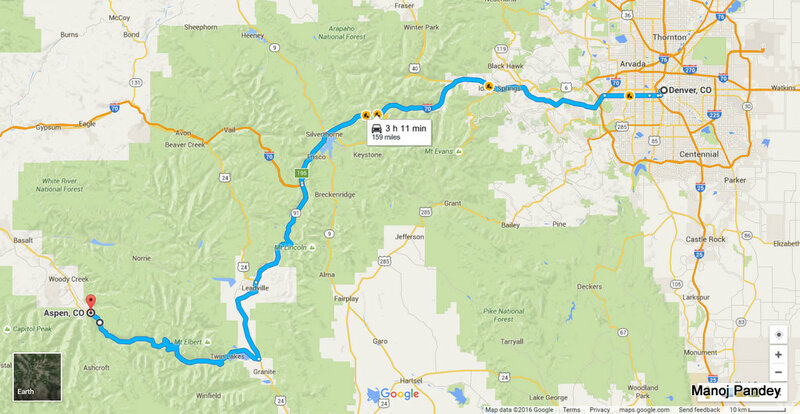 As we approached Copper Mountain, we left the I-70 and merged into CO-91 towards Leadville. As we were passing through CO-91 the natural beauty started showing its colors, driving on the smooth & broad freeway/highway surrounded by mountains was really mesmerizing. As we spotted a scenic lake [coordinates] by the left hand side we thought to stop by and experience the nature, the lake name was Clinton Gulch Dam Reservoir (below). After crossing Leadville at CO-24 we merged right into the CO-82 just near by the Twin Lakes [coordinates]. Stop by for few minutes, took a view and proceeded ahead. After driving ~17 miles we reached Independence Pass, stopped there for some time and had a scenic view of La Plata Peak, other mountains, valleys, and the curvy road down the hill. The chilling wind was blowing very hard and it was really a very good experience. This is a famous spot and a big tourist attraction for cyclist, hikers and nature lovers. It is generally open from Memorial Day (late May) until late October or early November, and closed all through winters. After driving for next ~20 miles we reached our destination i.e. Aspen. Aspen is really a beautiful town with lots of tourist attractions, malls, shops, restaurants, and other recreational avenues. The town was very well maintained, with beautiful flowers gardens, water fountains, horse carriages, etc. It is a perfect place specially for newly married honeymoon couples. After having lunch at a Chinese restaurant, we took the Gondola ride (Ropeway) to reach top of the ski mountain. The wind was very chilling and the view of Aspen city from top of the mountain was really nice. There was some wedding going on and people were involved in some rituals, so this is also a great spot for wedding !!! Going back to Denver we took an another route, via Glenwood Springs. Took CO-82, I-70, via Copper Mountain, Silverthorne, George Town, Idaho Springs, finally Denver, total distance of 198 miles (318 km), additional ~40 miles compared with the route we reach Aspen form Denver. Glenwood Springs is about ~41 miles form Aspen, and is located at the junction of two rivers, the Roaring Fork River and the Colorado River. Glenwood Springs is best known for its natural hot springs, and other recreational activities as well. An artists impression of Glenwood Springs town, the Roaring Fork river, the hot spring and the two bridges crossing the river, the curvy one for vehicles, and the second straight one for pedestrians. We jumped into the natural hot swimming pool, stayed there for an hour or two, and had lot of fun. By this time it was getting darker and time to leave back to Denver. We were also feeling hungry, spotted a Domino’s near by and had pizza. After the cheesy dinner we straight away headed back to Denver, and didn’t stopped in between all through ~157 miles (Glenwood Springs to Denver).